Every day we hold our mothers close. For some of us, it's through weekly FaceTimes, for others it’s Sunday squeezes or lunch date meet-ups. May is a time to honor the bonds, the relationships, the endless advice–the love. Make mama happy with some spring blooms and something shiny, too. Perhaps a Victorian era keepsake or pair of modern studs. Get inspired by the new arrivals below and shop online here. Celebrate the women who make you you. B.C.E. Jewelry 14k Kingman Turquoise Oval Necklace, Victorian Turquoise & Pearl Diamond Shaped Pendant with tiny locket back, Victorian Turquoise and Pearl Heart with locket back on 18k Fine Curb Link Chain, Victorian 15k Diamond Heart Locket on 14k Cable Chain , B.C.E. Jewelry 14k Kingman Turquoise Triangle Necklace, Antique French Cherub Charm and Victorian 10k Puffy Pearl Heart Pin Pendant on Mid-Century 14k Toggle Chain. Antique 14k and Black Enamel Book Locket and interior pages. Fully opened view of the 14k Victorian Black Enamel Book Locket with antique photos (removeable). 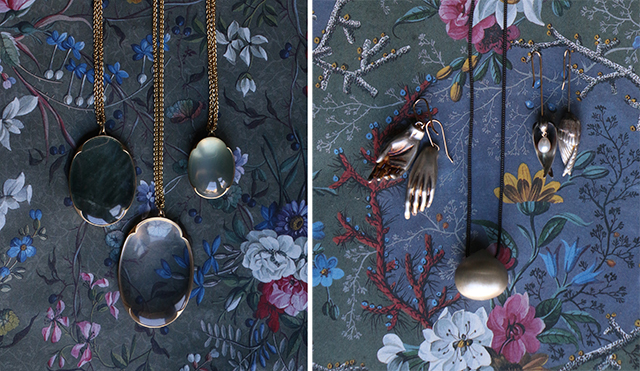 Gabriella Kiss 18k Gold and Gemstone Lens Pendant Necklaces, left to right, Moss Aquamarine Lens, Rock Crystal Lens, and Ceylon Moonstone Pendant. Gabriella Kiss Silver Hand Earrings, Gabriella Kiss Silver Hazelnut Necklace, Gabriella Kiss Silver Sleepy Birds Earrings. 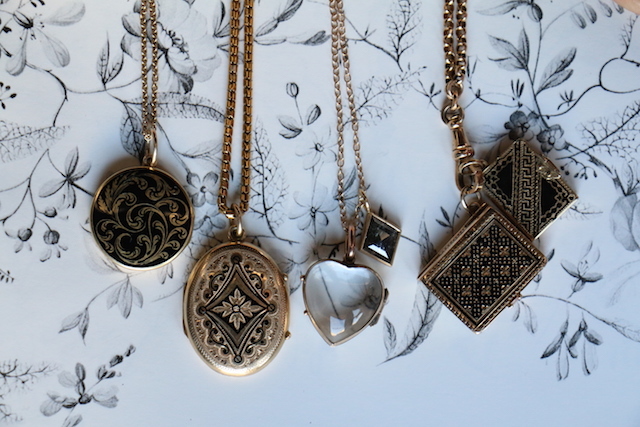 Early Victorian Gold and Black Enamel Memorial Locket on 14k Cable Chain, Victorian 14k Black Enamel Oval Etched Locket on Victorian 9k Snake Link Chain, Victorian 9k Carved Rock Crystal Heart Locket on Rebecca Overmann 14k Rosecut Charcoal Diamond Necklace, Victorian 14k Black Enamel Book Locket and Black Enamel Greek Key Book Locket on Victorian 9k Chain with Lever Hook. Gabriella Kiss 18k Small Oval Opal Ring, Gabriella Kiss 18k Eye Love Toke Ring Inscribed with "Invigilare" or to watch over in Latin. 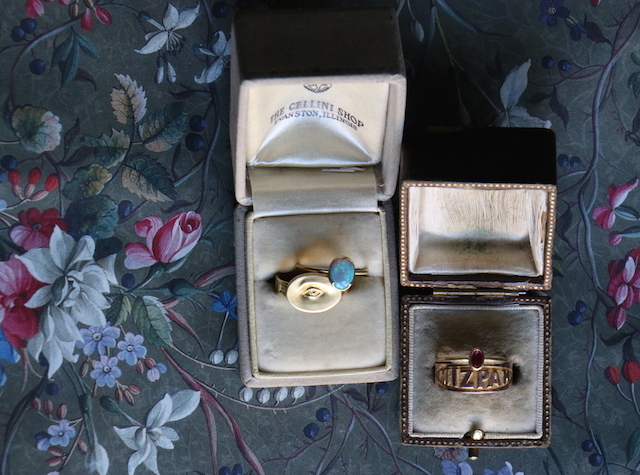 Gabriella Kiss 18k Faceted Oval Ruby Ring, Victorian 9k Gold Mizpah Ring. Mizpah literally means "watchtower" and was given as a sentimental token of love symbolizing the emotional bond between two people when they're apart.